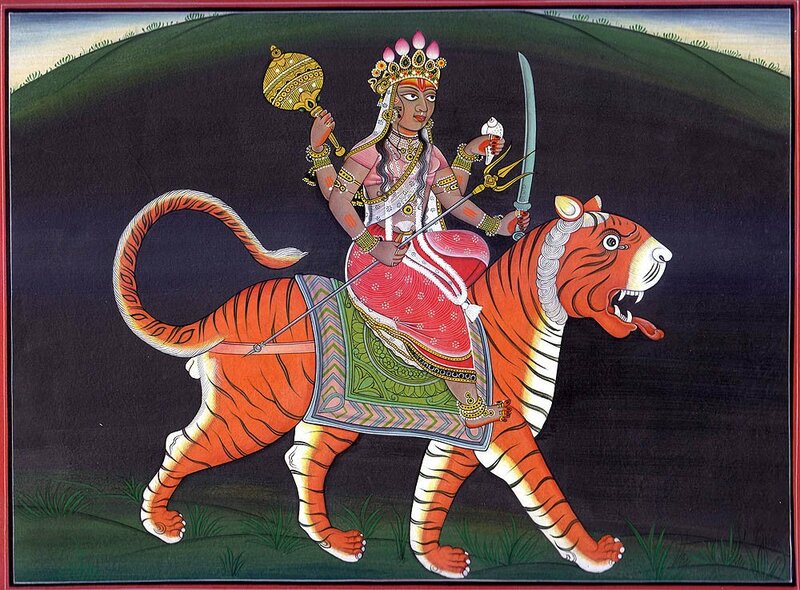 Essentially a votive image, the painting represents a form of goddess Durga as it most often emerges in her devotees’ vision : the four-armed lion-riding female glowing with divine aura and carrying in her hands the attributes of destruction, and on her face, the determination to destroy evil-doers, a tender-hearted mother and a formidable warrior. Not represented as engaged in an act of annihilation of any of the demons named in her related scriptures, this image of the mother assures general protective cover she is believed to provide not only against evil forces but also against worldly foes, the foes within oneself – one’s anger, greed, temptations, ill-will, unqualified desires among others, and ailments, failures and worldly ties. The ultimate, she destroys all that impedes the path to redemption and liberates the being from all material bonds. This image-type of the goddess might be seen as emerging in some unidentified early stone-reliefs; however after Puranas, particularly the Devi-Mahatmya, wove around her image the legends of her exploits against various mighty demons she appeared in stone or any visual medium as the ultimate operative force engaged in one act of annihilation or other. This image-type manifests a subsequent phase when priority of one sect over the other, that is, Vaishnavism and Shaivism, emerged as contentious issues endangering the sectarian unity of the Hinduism. Devi, claimed to synthesize into her being the divine lustre and attributes of all gods, irrespective of their sub-sectarian line, emerged as the most potential tool to those who sought to reconcile the warring factions. Sages and seers perceived Devi not only as the ultimate power : the mightiest and the most potent, against evil forces but also as one above all gods, Vaishnavite or Shaivite, even ‘Tri-murti’. While myths wove around her the legends of her exploits against all demons that had grown invincible against any male god, visual arts innovated such image of her that transcended sectarian divides. The destroyer of evil forces, her links with Shiva – the Destroyer, were a little more emphatic but her form reflected with as much emphasis her Vaishnava bearings, especially in the attributes she carried. This synthesis has been more powerfully revealed in this image that carries in three of her hands the Vaishnavite attributes : mace, conch and sword, and Shaivite, Trident, in the fourth. The lotuses, cresting her crown, an essential element of Vaishnava iconography, further strengthen her Vaishnavite bearing. Though a horizontal line suggestive of ‘Tri-punda’ – the Shaivite ‘tilaka’ mark, balances it, she has on her forehead a regular Vaishnava ‘tilaka’. The painting, a contemporary masterpiece, has been rendered using the late eighteenth century Pahari art idiom, or rather a stylistic blend of two of its major art-styles, Basohli and Mandi, besides the form of the goddess’s mount lion that rendered in ochre with white patches and black stripes represents the common idiom of almost all Pahari art schools. The form and style of lotuses used with the goddess’s crown is typical of Basohli art style. However in most other things, iconography with awful large eyes and bold features, voluminous body-structure, style of seating and the palette, all characteristic features of Mandi art school, the painting represents Mandi art style. Devi has been the most chosen theme of Mandi artists but while the paintings from the early phase, that is, the late seventeenth and early eighteenth century, are crude and somewhat awful, those from the later phase, as this one, are quite refined.